The Flexitallic Group (“Flexitallic” or the “Company) is a global leader in specialized sealing solutions and products serving the oil and gas, power generation, chemical and petrochemical industries in emerging and developed markets. Flexitallic was established in 2004 in Paris, France. Owned by a leading European private equity group, the Company has operations in seven countries and provides products to the energy industry in various capacities but did not have direct exposure to the upstream U.S. oil and gas industry. Flexitallic sought the help of GulfStar to locate and acquire a U.S. based custom seals and rubber manufacturer serving the upstream oil and gas industry to further expand the Company’s capabilities and product breadth. Working with Flexitallic’s executive management in the U.S. and Paris, GulfStar developed desired criteria that reflected the attributes of a targeted acquisition. GulfStar then identified and numerically prioritized more than 25 potential targets. A select group of companies was contacted by GulfStar to gauge interest in a possible transaction. The scope of the engagement evolved during the course of the assignment as the focus shifted toward a larger acquisition than what was initially contemplated to achieve more of the Company’s strategic goals for a transaction. "Adding Custom Rubber Products to our portfolio immediately positions Flexitallic as the global leader in static sealing technology across all segments of the energy industry: upstream, midstream, downstream and power generation. Its innovative approach to designing and producing highly-specialized solutions, with an uncompromising eye toward reliability and safety, is an ideal fit with other Flexitalic companies who operate with the same customer-centric values. When our management team searched for an investment partner to work with, GulfStar quickly stood out as the right partner. 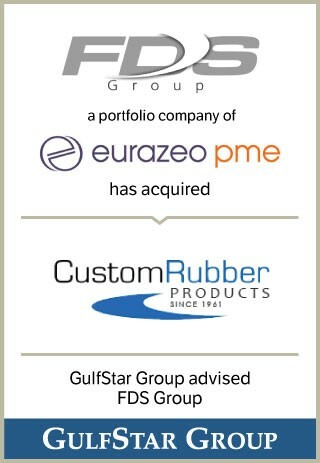 GulfStar listened to our needs and understood our market, which was critical to the acquisition of Customer Rubber Products. GulfStar ultimately identified Custom Rubber Products, a leading manufacturer in the custom molded sector serving the upstream energy market, as the preferred candidate for Flexitallic. GulfStar assisted in negotiating transaction terms, managing the due diligence process through an electronic data room and coordinating documentation efforts. Through a concerted effort between GulfStar, Flexitallic and numerous advisors, the process was highly efficient and the transaction took 91 days from initiation of our engagement to completion and funding. The GulfStar transaction team included Managing Director Kent Kahle, Vice President Chris Coonfield, Associate Bobby Bryan and Analyst Caroline Incavo. “We were extremely pleased to work with the Flexitallic team in Paris and Houston to identify and acquire a leading company in the custom molded sector serving the upstream energy market,” said Kahle. GulfStar continues to work with the Flexitallic team to identify acquisition candidates.